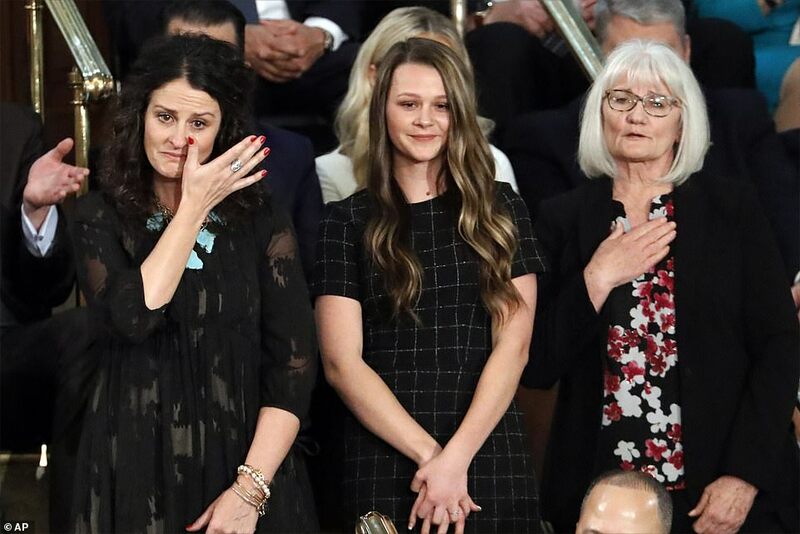 President Donald Trump began Tuesday's State of the Union address by snubbing the woman who has given him the most heartburn in the past five weeks. 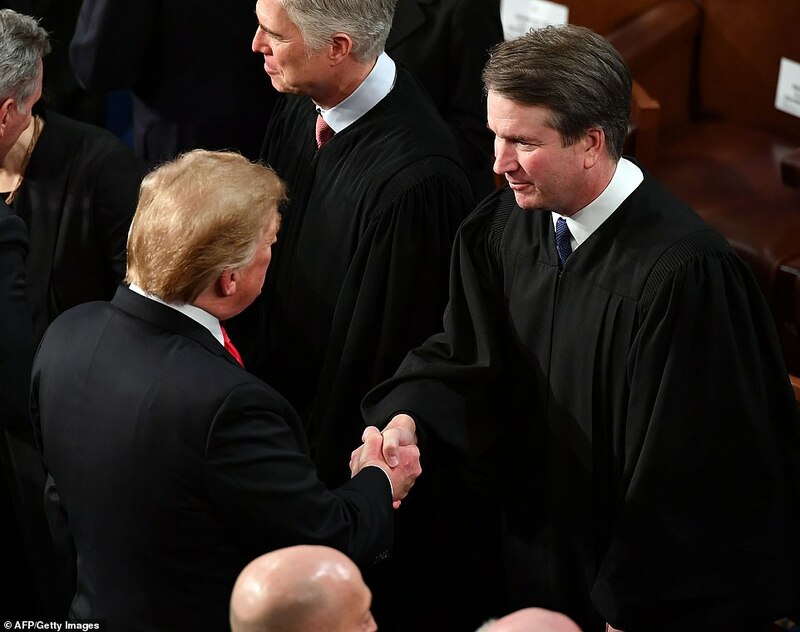 In a speech designed to call for 'cooperation, compromise and the common good' instead of partisan bickering and 'the politics of revenge,' Trump struck an unlikely chord at a time when disunity holds Washington and the nation captive. 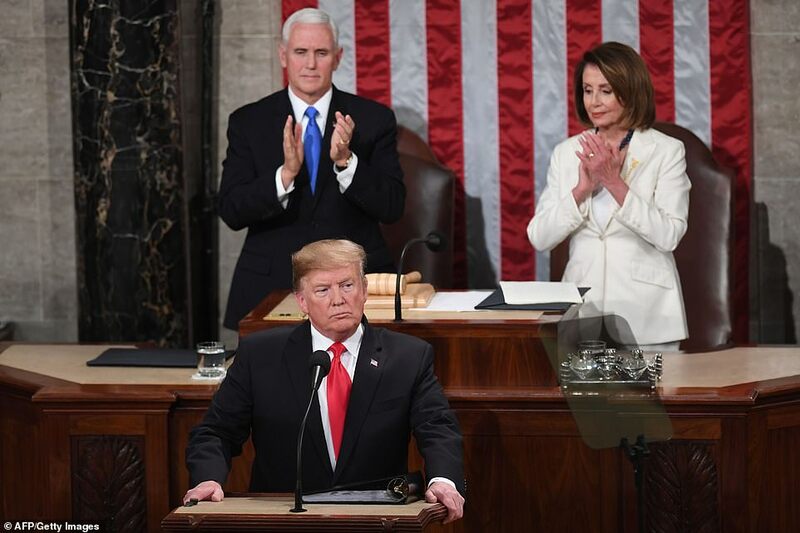 Trump called on Congress, including the Democrats' new House majority, to 'break decades of political stalemate' and put country over party. 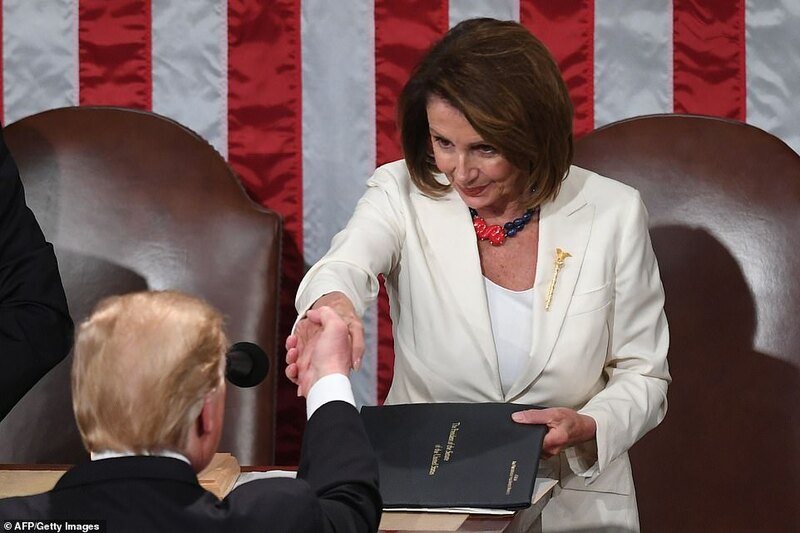 But he first gave House Speaker Nancy Pelosi, his official host for the annual speech, the cold shoulder. 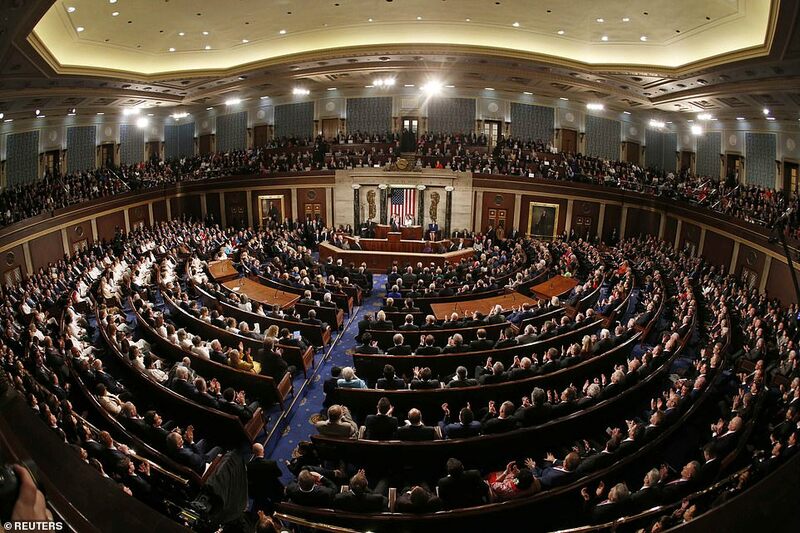 It's traditional for the speaker to introduce the president before an address to a Joint Session of Congress. Instead, Trump walked behind the podium and began speaking right away. 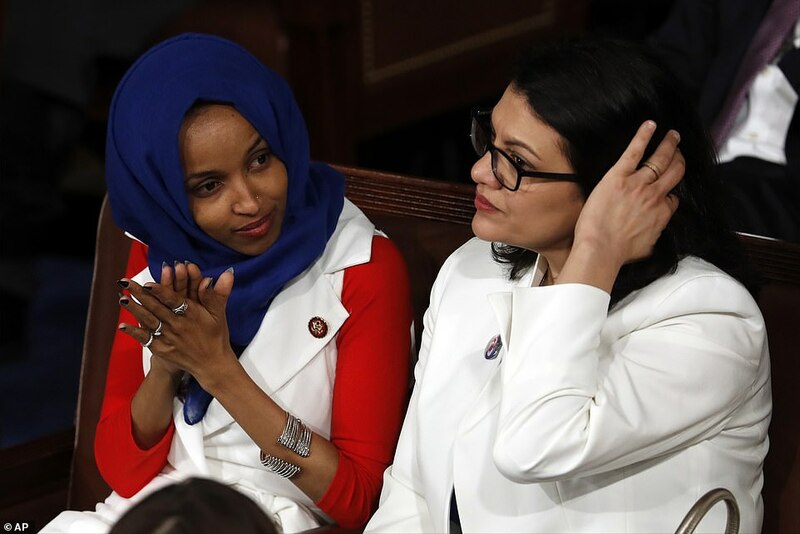 'We can bridge old divisions, heal old wounds, build new coalitions, forge new solutions, and unlock the extraordinary promise of America’s future. The decision is ours to make,' he said. 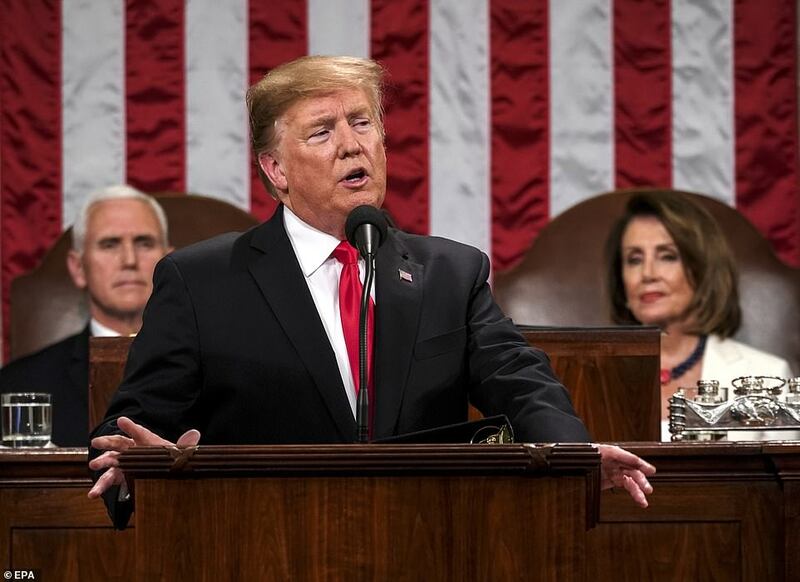 Minutes later the president blasted lawmakers, mostly those on the left, for opposing his top agenda item – hundreds of miles of steel walls on the southern border. Democrats groaned when he referred to a 'moral duty' to protect Americans from an 'onslaught' of migrants forming a new caravan in Central America and heading north. He demanded 'a new physical barrier, or wall, to secure the vast areas between our ports of entry,' while chastising lawmakers for their unwillingness to comply. 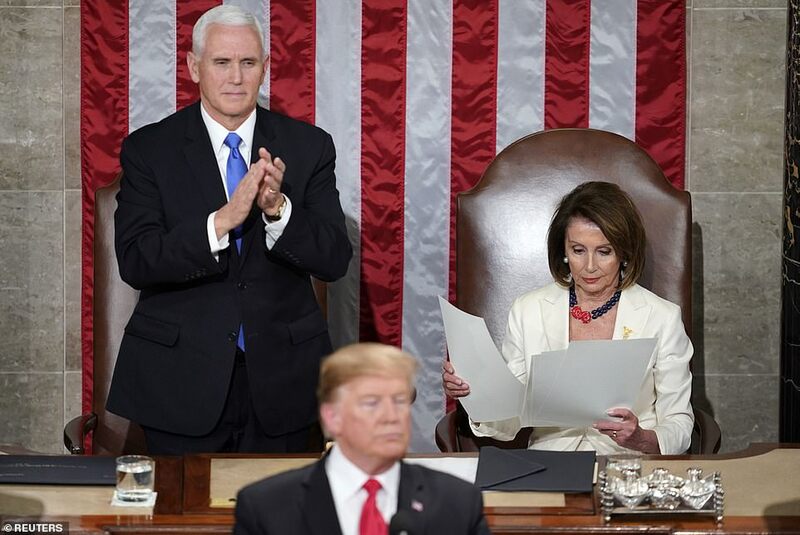 Pelosi chatted with Vice President Mike Pence, visible to the world behind the man of the hour, rising only to applaud patriotic, nonpartisan lines. 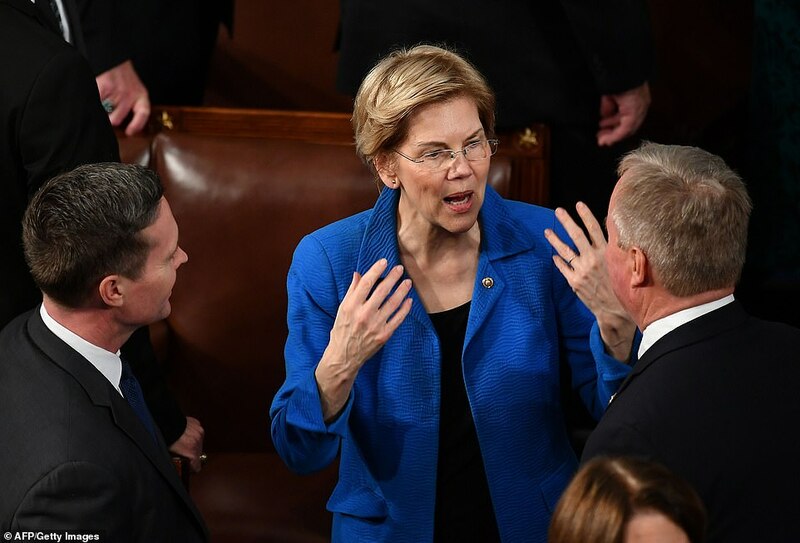 She wasn't amused to hear the president castigate her party for what's expected to be two years of aggressive congressional probes into everything from White House security clearances to as-yet unproven links between Trump's 2016 campaign and Russian agents. 'If there is going to be peace and legislation, there can't be war and investigation. It just doesn't work that way,' he scolded. 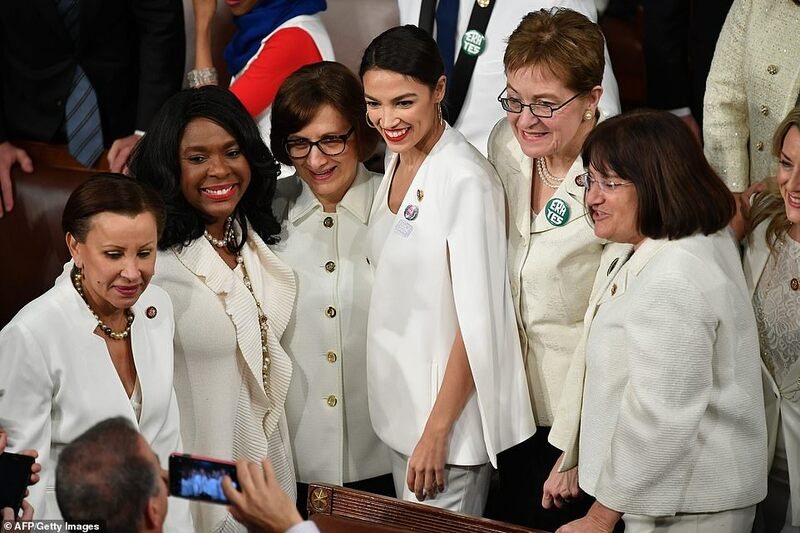 But Pelosi and women in her caucus erupted into cheers when Trump pumped up his economic performance by highlighting gains made by females in the U.S. workforce. 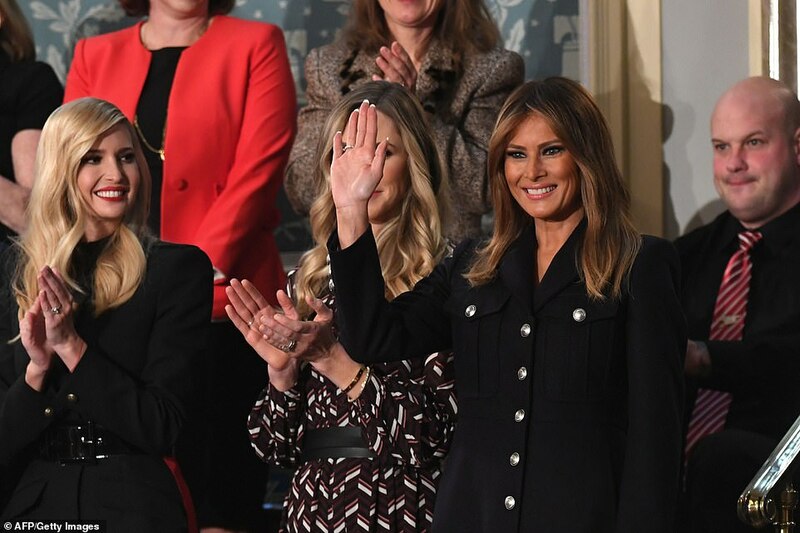 'No one has benefited more from our thriving economy than women, who have filled 58 percent of the new jobs created in the last year,' he said. 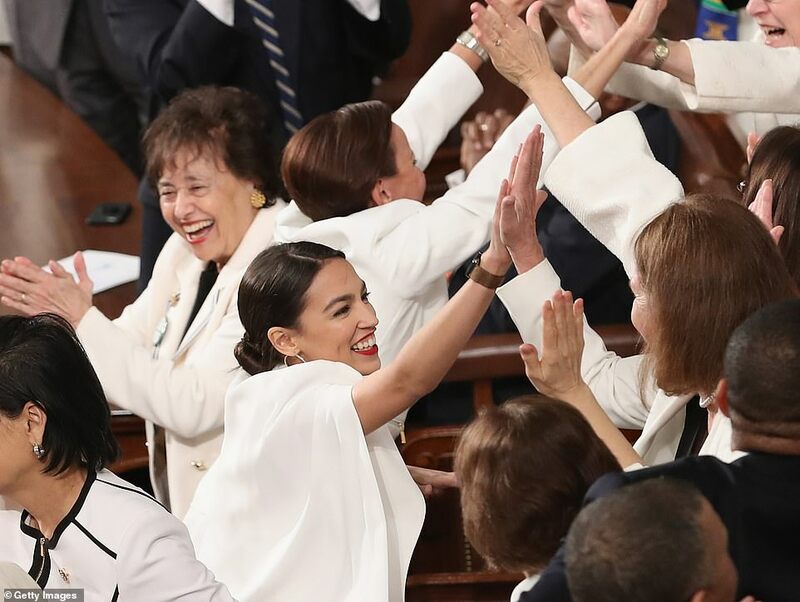 Democratic women, most notably the record-breaking newly elected freshmen, leapt to their feet and high-fived each other while Republicans laughed along at the unusual agreement. Sen. Kirsten Gillibrand, a New York Democrat who is among the foes aiming to replace him in 2020, flashed a gamely thumbs-up with both hands. 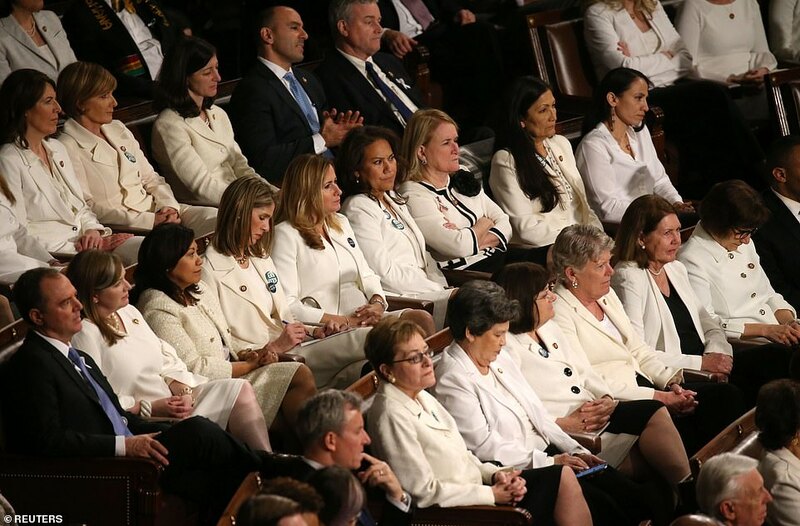 As the Democratic women began to take their seats, Trump again went off-script. Shouts of 'USA! USA!' rang out from both sides of the chamber. The president also revealed his plan to meet with North Korean dictator Kim Jong-un a second time on February 27 and 28, in his bid to kill off the hermit kingdom's nuclear weapons program. 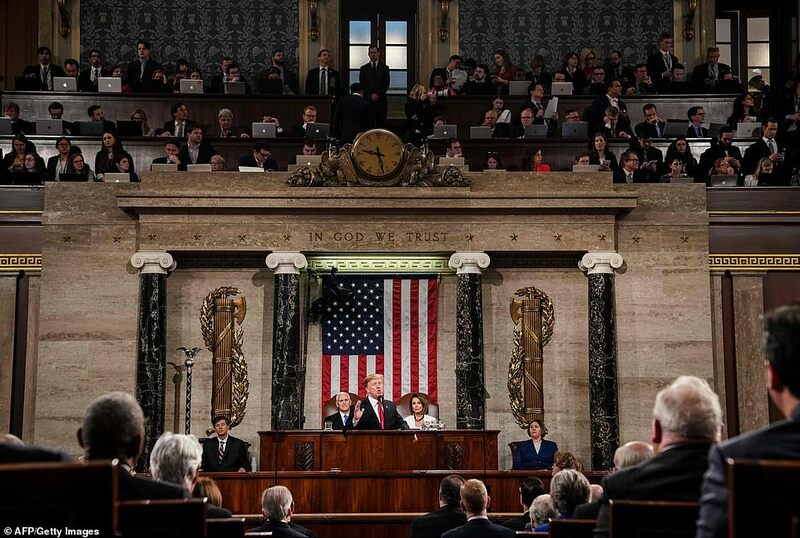 He marked the 75th anniversary of America's launch of the military campaign to liberate Europe in World War II, and the 50th anniversary of the first moon landing. Elderly veterans and astronaut Buzz Aldrin stood and acknowledged applause. 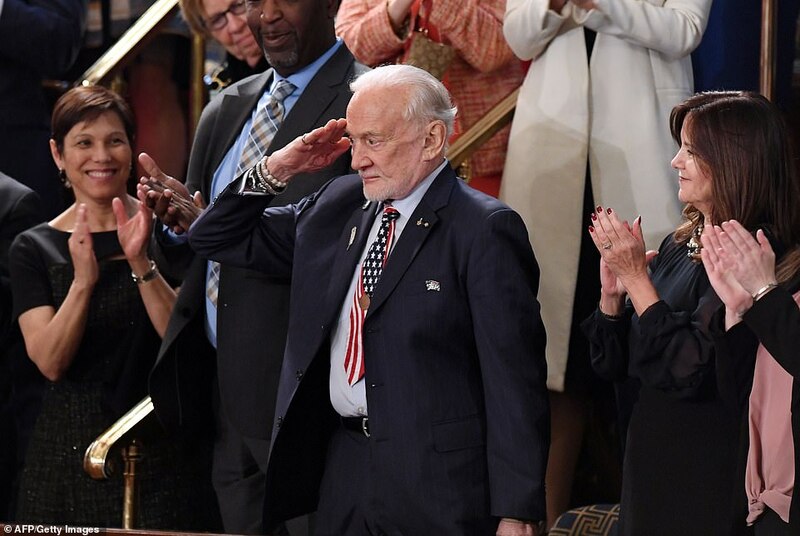 Aldrin, who once planted the U.S. flag on the lunar surface, wore an Old Glory-styled necktie and saluted the podium. 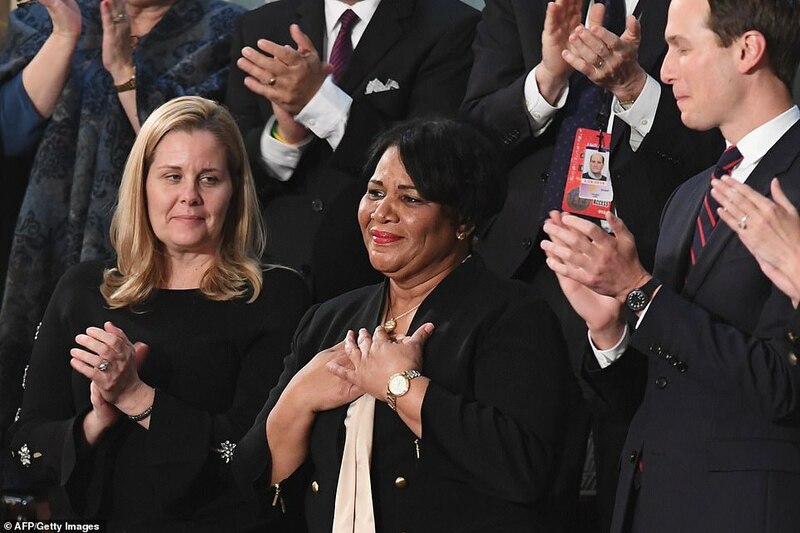 And he acknowledged Alice Johnson, a nonviolent drug offender who he ordered released from federal prison last year in the first step toward a broader criminal justice reform effort. 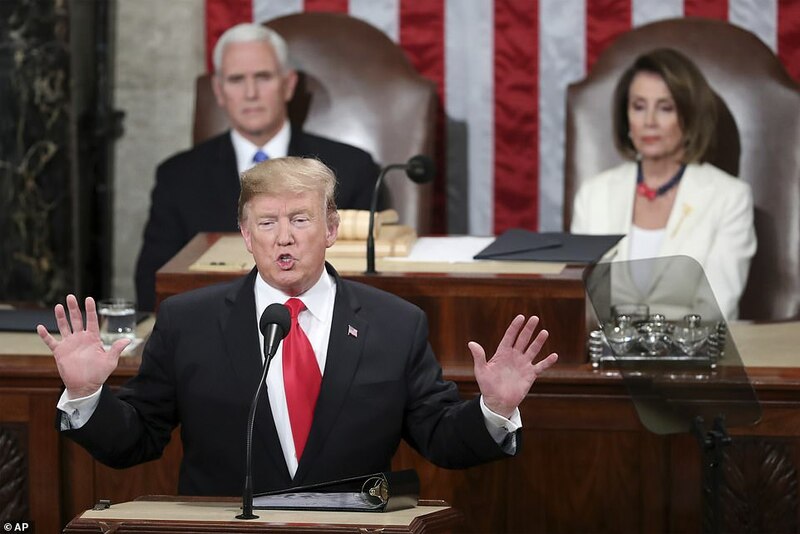 Trump's centerpiece on Tuesday was a renewed call for border security funding, including money for his long-promised border wall. 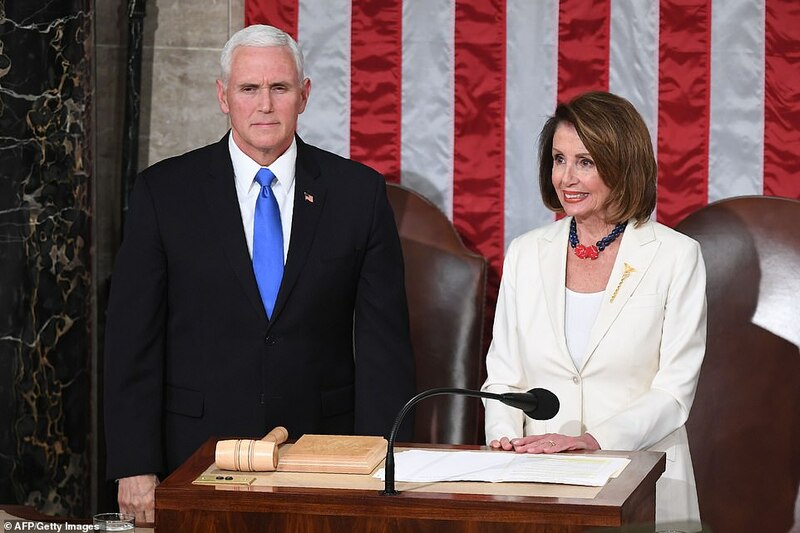 The president didn't make a move on Tuesday toward short-circuiting the legislative process by declaring a national emergency, a decision that would allow him to take border security into his own hands and leave Congress on the sidelines. Trump can use a 43-year-old law to suspend some limitations on his power to spend money if he declares that a national emergency exists. That would give him a path to erect a barrier between Mexico and the U.S. with billions of dollars Congress has already allocated for the Defense Department and other agencies. 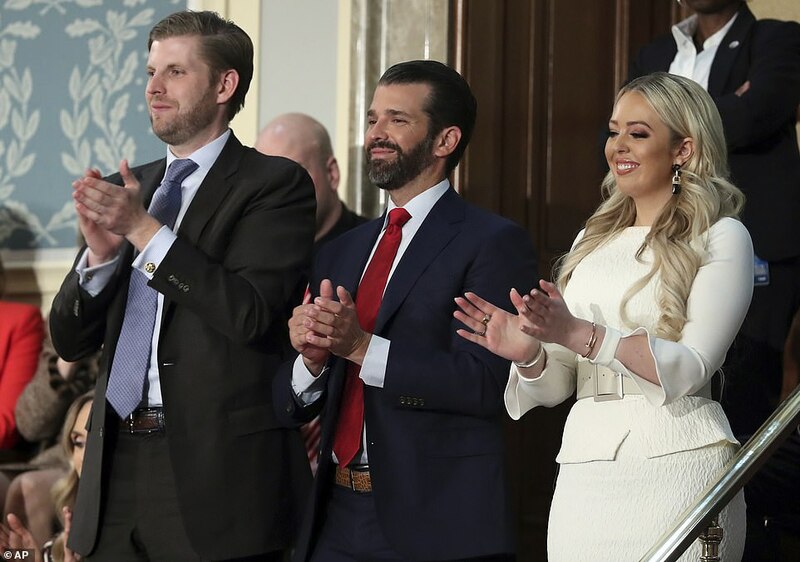 That move, if he makes it, would likely come February 15, when money runs out for about one-quarter of federal government spending. The White House has proposed a trade: the $5.7 billion in border wall money in exchange for legal status for 700,000 'Dreamers' enrolled in the Deferred Action for Childhood Arrivals program, and another 400,000 in the country under Temporary Protected Status. 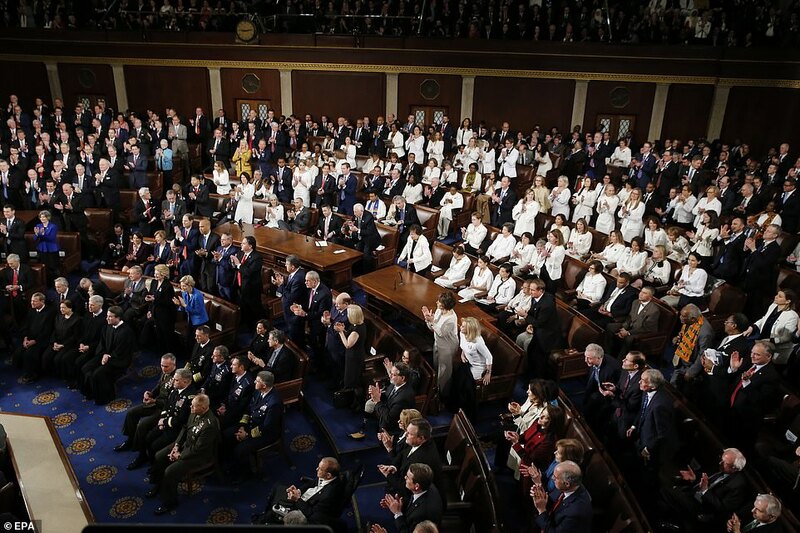 Among the night's loudest whoops from Republicans, shouted while Democrats sat on their hands, came when Trump introduced a border agent seated in the first lady's box. 'I will never abolish our heroes from ICE,' he said, as cameras panned across the faces of Democrats who have pledged to eliminate the agency. Trump has stormed out of a White House meeting. 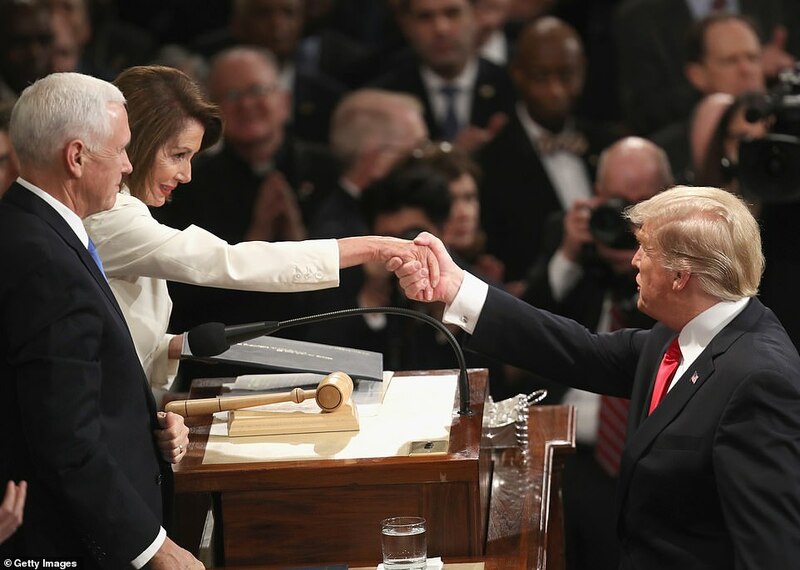 Pelosi, who sat stone-faced after the president steamrolled past her Tuesday without an introduction, has pledged to give him 'not a dollar' for his wall project. And Senate Minority Leader Chuck Schumer blasted the president in a pre-buttal, saying the nation is in the doldrums and Trump's calls for comity are unserious as long as he demands walling off Mexico from the U.S.
'Perhaps even more empty than his policy promises are President Trump’s calls for unity each year. ... In the past he's called for unity and he's forgotten about it by the next morning,' he said Tuesday. 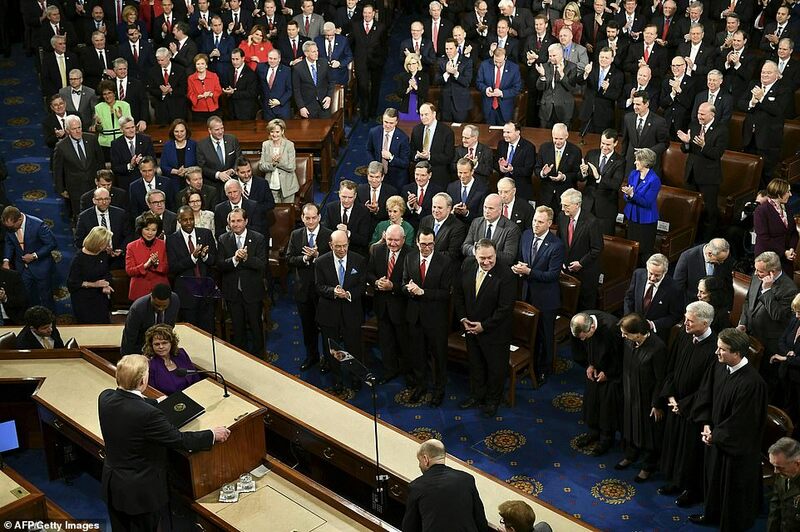 'Every year, the president wakes up and discovers that the desire for bipartisanship and unity is ephemeral. He doesn't really feel it. He's told he's supposed to say it at the State of the Union, and then it's gone,' Schumer told reporters. 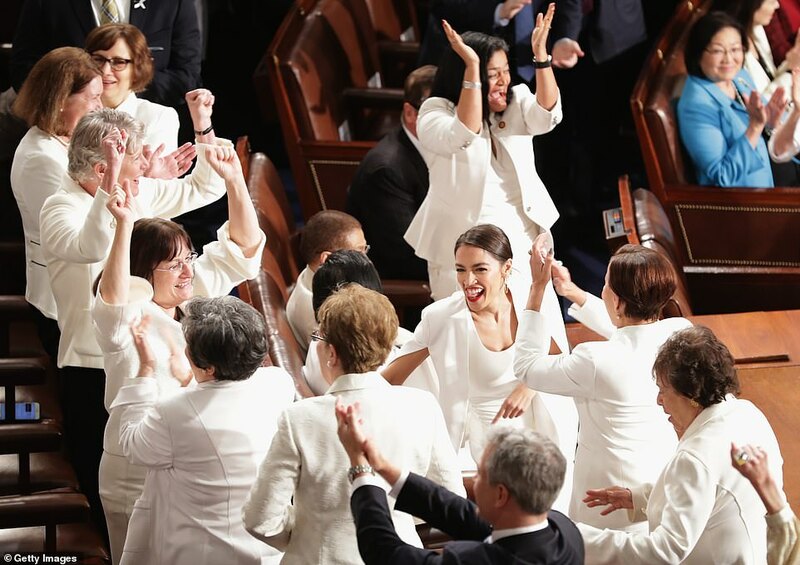 Pelosi led a large contingent of Democratic congresswomen in wearing all-white outfits to mark the success of American suffragettes in securing the right to vote a century ago. 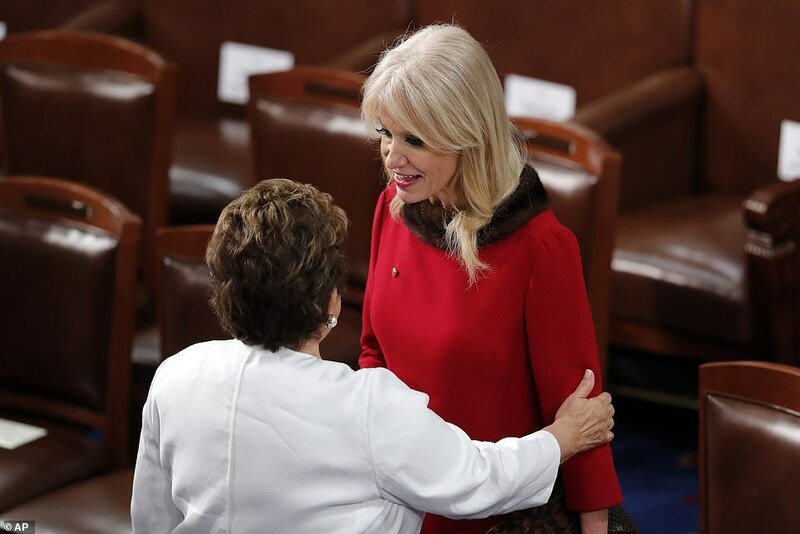 On the mostly male Republican side of the House chamber, dark suits abounded. 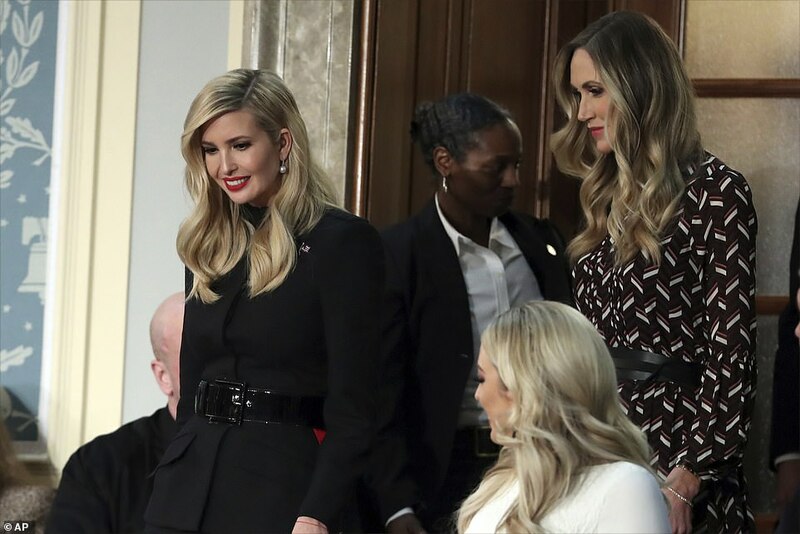 For the second year in a row, first lady Melania Trump arrived on her own, riding to the Capitol ahead of the president in order to greet her guests. Melania occupied the traditional gallery box. 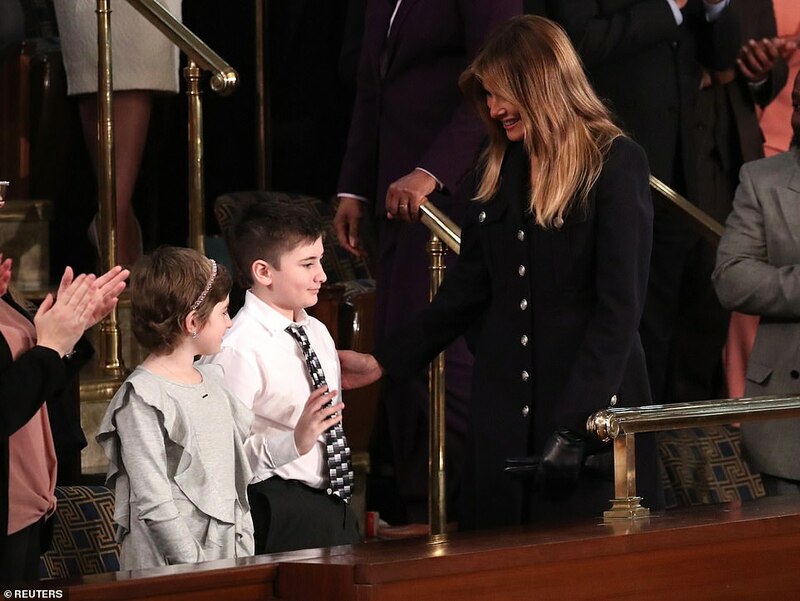 The president's first applause came when he mentioned her in the first line of his speech. The president's Cabinet sat in the House chamber, including five temporary cabinet secretaries serving in an 'acting' capacity. Energy Secretary Rick Perry was Tuesday night's 'designated survivor,' the Cabinet member chosen to spend the evening far away from the Capitol as a hedge against losing the entire presidential line of succession in the event of a catastrophe. 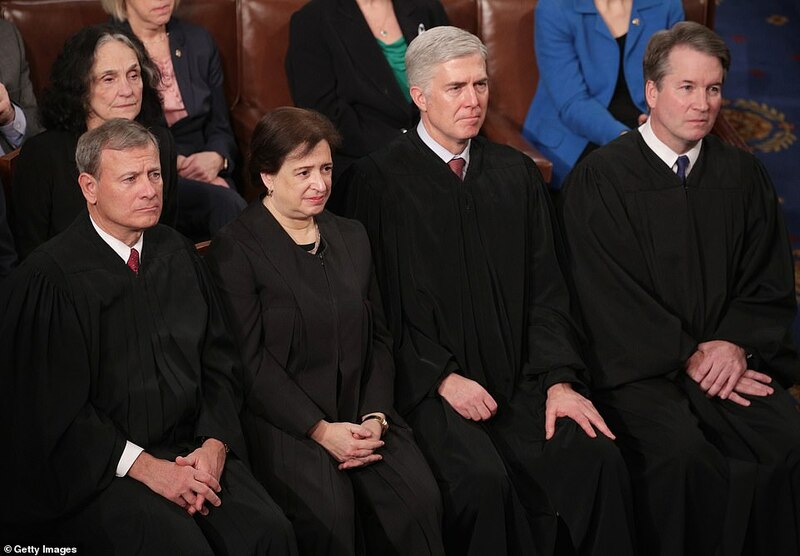 Most of the Supreme Court attended, but Justice Ruth Bader Ginsburg did not. She hasn't attended either of Trump's other speeches to Joint Sessions of Congress. 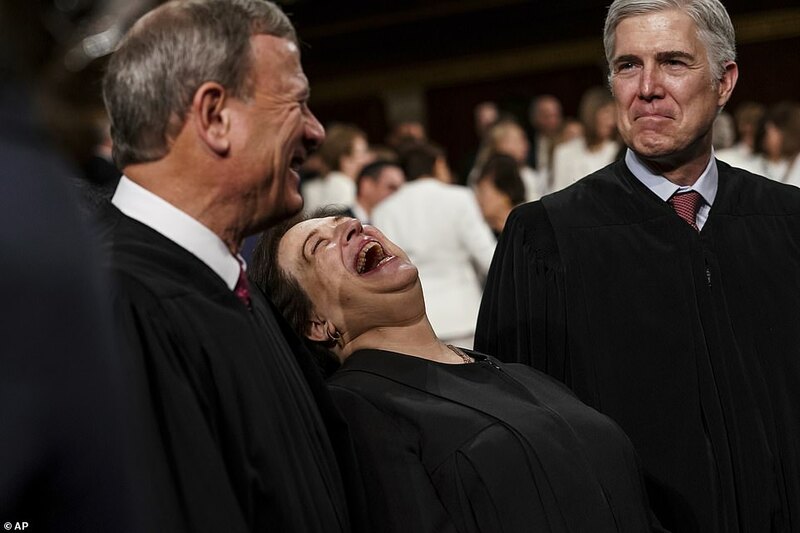 Ginsburg is still recovering from cancer surgery. She made her first post-operative public appearance Monday night at a concert of classical music written about her.